The U.S. Air Force Academy in Colorado, located north of Colorado Springs, is an institution for the undergraduate education of officers for the United States Air Force. When Can I Visit the U.S. Air Force Academy? The U.S. Air Force Academy in Colorado Springs is open to visitors daily. The Visitor's Center and Cadet Chapel are open from 9 a.m. to 5 p.m. The Visitor Center and Cadet Chapel are closed Thanksgiving Day, Christmas Day and New Year's Day. The Visitor Center is also closed Christmas Eve and New Year's Eve. Visitors to the U.S. Air Force Academy must enter through the North Gate, which can be accessed from Exit 156 on Interstate 25, 14 miles north of downtown Colorado Springs. Chapel tours are given frequently. Please visit the U.S. Air Force Academy Visitor Center for more information. 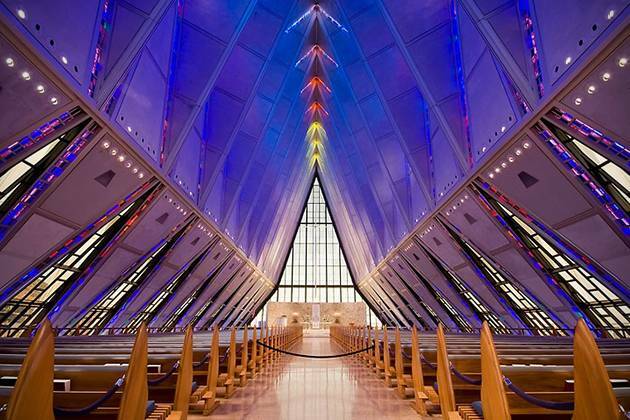 The U.S. Air Force Academy in Colorado is perhaps best known for its stunning chapel. Soaring 150 feet toward the Colorado sky, the U.S. Air Force Academy Chapel is an all-faiths house of worship designed to meet the spiritual needs of cadets. It contains a separate chapel for four major religious faiths — Protestant, Catholic, Jewish, and Buddhist — plus an all-faiths room used by Muslim cadets and available for members of the other faiths as well. Each chapel has its own entrance, and services may be held simultaneously without interfering with one another. The aluminum, glass and steel structure features 17 spires. There is no significance to this number. Original designs were too expensive, so changes were made, among them a reduction in the number of spires. The changes did not alter the basic design or the interior square footage of the chapel, however. The chapel structure cost $3.5 million to build. Furnishings, pipe organs, liturgical fittings and adornments of the chapel were presented as gifts from individuals, organizations, and donations from Easter offerings made at Air Force bases. The chapel was recently named one of CNN's most epic churches in America. The newly renovated USAFA Planetarium features daily shows such as: Journey to the center of the Milky Way, Fighter Pilot and Robot Explorers. A generous donation allowed the Academy to re-open the doors to the 50-foot dome after 15 years of renovations, complete with state-of-the-art reclining seats, inter-connectivity with planetariums around the world and a live feed from the largest publicly accessed telescope in Colorado, also accessible at the Academy’s Observatory. What are the top 11 must-see attractions at the U.S. Air Force Academy? Here are the top 11 must-sees for visitors. Click here to for more details on these attractions. What kinds of hiking and biking trails are available at the US Air Force Academy? Visitors can enjoy several trails from 5 am until sundown daily. Be sure to pack sunscreen and layers of clothing as the mountain weather can change quickly. Carry water with you to stay hydrated too! Here’s a list of all the trails available to explore. Are there dining options available for visitors on base? Yes, there are plenty of options for grabbing a snack or meal while you are on the base. Options include fast food and favorite chains, pub fare, and several restaurants serving lunch and dinner. Here is a list of all the dining options and their hours of operations. What kind of events happen at U.S. Air Force Academy? There are plenty of events year-round at the base. For a full schedule of events, visit the US AFA’s website. The Air Force Academy cadets compete on 27 NCAA Division 1 teams, primarily within the Mountain West Conference. Get tickets to an upcoming game and cheer on the Falcons at during their most popular sporting events including football, basketball, volleyball, and hockey. Who attends the U.S. Air Force Academy? The U.S. Air Force Academy in Colorado is among the most selective colleges in the United States. Candidates are judged based on their academic achievement, demonstrated leadership, athletics and character. To gain admission, candidates must also pass a fitness test, undergo a thorough medical examination and secure a nomination, which usually comes from one of the candidate's members of Congress. Recent incoming classes have usually consisted of about 1,400 cadets; just under 1,000 of those usually make it through to graduation. Cadets pay no tuition but are committed to serving a number of years in the military service after graduation. Graduates of the four-year program receive a Bachelor of Science degree and most are commissioned as second lieutenants.